All the Democrats and seven of the Republicans on the committee voted for the amendment, which after all just reasserts a founding principle of "no religious tests" in Article VI of the U.S. Constitution. Sen. Ted Cruz voted against it, even though he wasn't present. Also voting against the amendment -- Thom Tillis, that towering monument of statesmanship which is crumbling like chalk under the pressure of un-American "Trumpism." 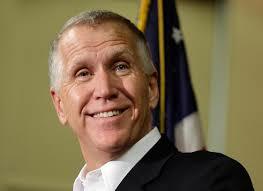 Tillis reads the polls, and although he has another five years before he faces the voters in North Carolina again, he evidently decided that he'd just go ahead and proclaim his far right credentials now to all those extreme elements in his own party who are currently gung-ho for Trump's brand of racism. It was an easy call, probably. What North Carolina politician has ever gone wrong parroting the latest in racial fear?